Friday, July 4th 2014 was a special day for gamers everywhere. It saw the release of the Dungeons & Dragons Starter Set for the new version of Dungeons & Dragons—that is Dungeons & Dragons Fifth Edition. This is the introduction to the finished version of Dungeons & Dragons Next which has been through several rounds of development and public play-testing by Wizards of the Coast over the last two years. The deep box for this Dungeons & Dragons Starter Set includes a 32-page rulebook, a 64-page adventure book, five pre-generated characters, and a set of polyhedral dice. The Dungeons & Dragons Starter Set is designed to take a group of four or five adventurers from First Level up to Fifth Level using the given pre-generated characters. At the same time, Wizards of the Coast also released Basic Dungeons & Dragons, a PDF version of the rules that includes the rules for character creation as well more detailed rules on how the game is played and magic is handled. The fact that Basic Dungeons & Dragons has only been released as a PDF and is labelled as being ‘Version 0.1’ means that it can be updated freely and easily without the need for a new print run. Its release also means that more experienced gamers could take the rules from Basic Dungeons & Dragons and use them to run the material presented the Dungeons & Dragons Starter Set. This includes the creation of their own adventurers as it includes rules for the Dwarf, Elf, Halfling, and Human races as well as the Cleric, Fighter, Rogue, and Wizard Classes. The problem is that in order to get the fullest experience out of the Dungeons & Dragons Starter Set, a group will need to download the Basic Dungeons & Dragons PDF, and that undermines the point of the Dungeons & Dragons Starter Set. Which is to provide a complete playing experience and that includes the creation of characters. The rules present in the 32-page rulebook will be familiar to anyone who has played Dungeons & Dragons. An adventurer (and each monster, when you get to the adventure book) has six Abilities—Strength, Dexterity, Constitution, Intelligence, Wisdom, and Charisma—each of which can provide an Ability Modifier used throughout the game. The core mechanic is still the roll of a twenty-sided die against a Difficulty Class or an Armour Class. Apart from Constitution, all of the Abilities have associated skills. For example, the Athletics skill is associated with Strength, whilst the Animal Handling, Insight, Medicine, Perception, and Survival skills are associated with Wisdom. The most notable change to the core rules is that a character can have an Advantage or Disadvantage in situation. When he has an Advantage, the character’s player rolls not one twenty-sided die, but two, and then uses the best result. Conversely, if he is at a Disadvantage, he rolls two twenty-sided dice and uses the worst result. For example, a character is defending against an Orc that is climbing up a ladder to attack him. The character would be at an Advantage when attacking the Orc. When the Orc comes to attack the character, then he would be at a Disadvantage. The other change is that each character has a Proficiency bonus, initially equal to +2. Whenever a character uses either a skill or a set of tools with which he has a Proficiency—for example, one of the two pre-generated Human Fighters in the Dungeons & Dragons Starter Set has the Proficiencies of all armour, shields, simple weapons, martial weapons, carpenter’s tools, and vehicles (land). The Proficiency bonus applies to weapons as well as skills and tools—though this is not obvious from the paragraph devoted to the Proficiency bonus in the rulebook, but is explained in the combat rules—and some monsters can have a Proficiency bonus. Initiative in combat is handled by a Dexterity check and when a character acts, he can move and undertake one action. This can be a combat action or something else, but a character can also gain bonus actions or reaction actions under certain circumstances. For example, one of the two pre-generated Human Fighters in the Dungeons & Dragons Starter Set has a Trait called ‘Second Wind’ which gives him the opportunity to recover some Hit Points as a Bonus action. The most obvious type of Reaction is an opportunity attack.There must be others, but they are not given in either the Dungeons & Dragons Starter Set or Basic Dungeons & Dragons. Characters begin play with the maximum number of Hit Points possible, equal to the Hit Dice for their Class, plus Constitution modifier. In addition, for each Level a character also has a Hit Die, equal to that of his Class. Whenever he has taken damage and takes a Short Rest—equal to an hour or so—he can expend these ‘temporary’ Hit Dice to heal Hit Points. Once expended, most of these Hit Dice and a character’s full Hit Points can be recovered with a Long Rest of eight hours or more. As a party goes on adventures, it will gain Experience Points which will go towards each character’s next Level. Only 300 Experience Points are necessary for a character to go from First Level to Second Level, then 900 Experience Points for Third Level, and so on. Killing a Goblin is only worth 50 Experience Points, a Hobgoblin or Orc is worth 100 Experience Points, and a Bugbear is worth 200 Experience Points—and this is typically divided amongst the party. In comparison with previous iterations of the game, this version of Dungeons & Dragons does lend itself to faster progression at the lower Levels. In terms of arms and armour, everything that you would expect to be present is in the equipment lists (the Morningstar is present, though no flail). The weapons list includes some interesting weapon properties. ‘Light’ weapons such as club or scimitar are used with the rules for fighting with a weapon in each hand; ‘finesse’ weapons like the dagger or rapier can be used with either the user’s Dexterity or Strength modifier for attack and damage rolls; and ‘versatile’ weapons, such as the quarterstaff or warhammer, can be used one- or two-handed and get a correspondingly bigger die for damage when used two-handed. The rule for the latter is really simple—light weapons only and only one of the weapons benefits from the Attack and Damage Modifier. Armour is classed as being either light, medium, or heavy. Only light armour, leather or studded leather, grants the wearer full use of his Dexterity modifier to his Armour Class. Medium armour grants a maximum Dexterity modifier of +2 and heavy armour negates the use of the Dexterity modifier altogether. What this does is flatten Armour Class inflation. Even the most agile of characters, with Dexterity of 18 (+4 modifier) and wearing studded leather (AC 12) is never going to have an Armour Class of more than 16 without magical aid. Compare that to a fighter in medium armour like scale mail (AC 14), maximum Dexterity modifier of +2 and carrying a shield (AC +2) for a total AC 18 or in a heavy chainmail suit (AC 16) and carrying a shield (AC +2) for a total AC 18 for similar total AC 18, and it is obvious that the advantage goes to the wears of medium and heavy armour, but not by much. Further, the medium and heavy armours are obviously more expensive. The last part of the rulebook is devoted to spells. The first thing to note is that both Clerics and Wizards get cantrips—spells that can be cast as often as a character likes. Otherwise, spellcasters still have a number of spells and spell slots per day that they can cast. Some spells can be cast Rituals—this takes longer and does not expend a spell slot, but again, none are listed in the Dungeons & Dragons Starter Set. More interesting is the fact that lower level spells can be cast in higher level slots for greater effect. So for example when a cleric casts the Bless spell in a second level or higher slot, it affects more people. What this means is that each and every spell will always have a standard effect unless the spellcaster decides to improve it. In other words, a spell does not get better the higher the Level of the caster. Thus the Magic Missile spell will always launch three magical darts that inflict damage unless the caster casts in a higher level slot. The five pre-generated adventurers in the Dungeons & Dragons Starter Set consist of two Human Fighters, a High Elf Wizard, a Lightfoot Halfling Rogue, and a Hill Dwarf Cleric. Notable additions on each of the five pre-generated characters include not just a Background, but also Personality Traits, Ideals, Bonds, and Flaws. For example, one of the Fighters is a Human with the Background of Folk Hero; the Personality Trait of ‘When I set my mind to something, I follow through. Also, I use long words in an attempt to sound smarter.’; the Ideal of ‘Sincerity. It’s no good pretending to be something I’m not.’; the Bond of ‘One day, Thundertree will be a prosperous town again. A statue of me will stand in the town square.’; and the Flaw, ‘I’m convinced of the significance of my destiny, and blind to my shortcomings and the risk of failure.” All of these are a character’s personality characteristics and when a player roleplays his character according to one of them, the DM can reward him with Inspiration. There are two things that a player can do with his Inspiration. First, he can expend it to gain an Advantage when his character has to make an attack roll, saving throw, or ability check. Second, he can reward another player for good roleplaying, clever thinking, or doing something fantastic in the game by giving him the Inspiration. Whichever character it ends up with, this Inspiration is all that a character can have until he uses it—that is, he cannot Inspiration stacking up. He must use it before gaining more. Whether this will encourage him to hold on to it or expend it and play well enough to gain some more will depend on the player. What you have here is a mechanic and a rule—in Dungeons & Dragons—that specifically encourages roleplaying for the first time in forty years! This is highly laudable, especially given the singular failure to support roleplaying in the previous edition of Dungeons & Dragons. Annoyingly, the rule for Inspiration is not in the rulebook, but in the adventure book presented for the GM—not the players. This highlights an issue in the Dungeons & Dragons Starter Set, that of not being as good an introduction to roleplaying as it should be. This is only compounded by the other omission in the Dungeons & Dragons Starter Set—the lack of a decent example of play. The rulebook includes a very cursory example of an exchange, but this lack in intentional. As explained here, the idea is that the Dungeons & Dragons Starter Set should provide long-term value and not contain material that would become irrelevant once the full version of the game was released. So notable examples of this intent is the lack of a tutorial explaining what roleplaying is and the lack of a scripted adventure that would teach the rules. The suggestion is that an online video would be a better means of providing that tutorial. This fundamentally undermines the point of a Dungeons & Dragons Starter Set. It should be complete, it should introduce the game to prospective players, and it should help get them playing. Pointing a prospective player to an online video rather have him play through a tutorial means that he is going away from the Starter Set he just bought not to learn how to play, but to be told how to play. A tutorial with a programmed means of play would get the player immediately involved in the game and rolling dice. Further, it would show him how to play and not just tell him. Fortunately, the DM is not treated in quite so underwhelming a fashion. Unfortunately, the initial impression is that he is going to be, as it appears that the adventure book is only going to give the basics of how to be a good referee and no more. Once you get into the adventure, advice is present on how to handle different scenes, NPCs, and so on. The adventure itself is ‘Lost Mine of Phandelver’, a lengthy four-part affair set firmly in the Forgotten Realms, south-east of the city of Neverwinter that is designed to take the characters from First Level up to Fifth Level. It begins in somewhat of a clichéd fashion—the characters are escorting a caravan to a town called Phandalin when they are ambushed by goblins. All right, it does get them involved and if the party deals with the goblins they will uncover the first of many clues that will lead to the adventure’s denouement. Of course, the next cliché is that Phandalin is a village under threat, but the adventure obscures the external threat with an internal threat. This internal threat, a gang of ruffians, in the village feels rather forced, even unsubtle, but that is the point, as it focuses everyone’s attention on them rather than on the external threat, whomever it is they are working for. None of the adventure’s major encounters is particular large—most consist of little more than fifteen encounters, though the end dungeon consists of twenty encounters. For the most part, the encounters are well designed and nicely detailed, but the end encounters with the main villains often feel underwritten and lacking somewhat in flavour and detail. There are some great encounters here, but the motivations of these characters are not always obvious. Nevertheless, this is a good adventure that presents a solid mix of combat and roleplaying encounters. Rounding out the adventure book are two appendices. Appendix B is devoted to the monsters that appear in the adventure, a good mix of the Dungeons & Dragons standards—Orcs, Goblins, Owlbears, and so on—and the slightly more outré—Gricks, Nothics, Twig Blights, and the like. In terms of information and stats, the monsters here lack the density of information that previous versions of Dungeons & Dragons possessed, but they still have the same six Abilities that player characters have in addition to whatever powers and special moves and capabilities they may have. More interesting is Appendix A, which is devoted to magic items. It discusses how to use them and identify them. The latter is easier than before, requiring concentration and a Short Rest, or a taste in the case of potions, so no longer is there the pot luck aspect of testing devices and potions. There is no advice on cursed items, as the magic items listed are all from the ‘Lost Mine of Phandelver’ and no such items appear in it. It takes a character a Short Rest to attune himself to a device and he cannot be attuned to more than three items at any one time. Of the magical items present in the adventure—and there are a relative few, the rest being potions and scrolls—the most interesting are the staves and wands. Just as in previous editions of Dungeons & Dragons, they have charges that expended for various spell-like effects. They only have a few charges, but they recharge daily! There is a chance that they might stop working if all of the charges are expended, but this empowers the users of these magical items. No longer are they devices to be husbanded carefully because they take so much effort to recharge such that it is easier to purchase or find a new one. Overall, the magic items in ‘Lost Mine of Phandelver’ tend to favour the spell-using characters than the Fighter or the Rogue. Physically, the Dungeons & Dragons Starter Set is nicely put together. The books are solidly written, barring an issue or two that needed to be checked in the Basic Dungeons & Dragons PDF and the adventure is entertaining. The illustrations are also good and the cartography very nice. Sadly both the rulebook and adventure book are misnamed—neither is a book. They are magazines or even booklets, but not books. For that, both need to have covers. They lack them though and the result is that as glossy as both are, neither stands up to much in the way of punishment. Two physical omissions from the Dungeons & Dragons Starter Set are a map and a set of counters for the adventure’s monsters. This is either annoying or a good idea—if not both. It is annoying because the map and counters would have helped spur the imagination of the prospective player during the game, but a good idea because it enforces the concept that Dungeons & Dragons is a game of the imagination, one in which maps and figures are not necessary. Further, it divorces Dungeons & Dragons Fifth Edition from the skirmish battle format of the previous edition. So far, so good. If you have read this far and have played Dungeons & Dragons in the last forty years, then the Dungeons & Dragons Starter Set is easy to pick up, start reading, and then start playing. It may be necessary to refer to the Basic Dungeons & Dragons PDF, but for anyone who has roleplayed, whether they have roleplayed or not, this is a good introduction to Dungeons & Dragons Fifth Edition. If you have not roleplayed before, then the Dungeons & Dragons Starter Set is not quite what you are looking for. The sad fact is, as an introduction to the hobby, the Dungeons & Dragons Starter Set is not everything that the introduction to the world’s premier roleplaying game should be. The problem is very, very simple. It fails to address the question, “What is roleplaying?” in as an adequate a fashion as it should. The introduction to roleplaying is not detailed enough—and neither is the introduction to being a Dungeon Master, although it is better than that of the introduction to roleplaying. The box fails to include a stepping stone between opening the box and delving into Dungeons & Dragons which a simple programmed adventure and a good example would have provided. The sad fact is, the red box Dungeons & Dragons Essentials Starter Set for Dungeons & Dragons Fourth Edition did that and it did a good job too—just not to a good version of Dungeons & Dragons. Similarly, the Pathfinder Roleplaying Game: Beginner Box does a good job too, but that is to a more involved version of Dungeons & Dragons than Dungeons & Dragons Fifth Edition. The point is this. Just because an item might not be used again, it does not mean that it is a waste of time including it in the box, especially if that item is not just an introduction to the very hobby, but a show and tell for that hobby that your product is intended to be the point entry to the premier game in that hobby. So the question is, what do I think of Dungeons & Dragons Fifth Edition as presented in the Dungeons & Dragons Starter Set? Its simplicity is impressive, the rules feel cleaner and streamlined in comparison to previous editions, and the addition of Personality Traits, Ideals, Bonds, and Flaws pull the game away from its wargaming roots, especially when combined with the rules for Inspiration. This is not to say that previous editions of Dungeons & Dragons have not been roleplaying games—though if you were being generous, then the jury has yet to come back in Dungeons & Dragons Fourth Edition—but these additions mark Dungeons & Dragons Fifth Edition as so being. In some ways, Dungeons & Dragons Fifth Edition is a streamlining of Dungeons & Dragons Third Edition, one that moves it back towards the Basic Dungeons & Dragons Cyclopedia in terms of ease of play. At the same time—and this is without seeing the full rules yet—those in the Dungeons & Dragons Starter Set suggest that Dungeons & Dragons Fifth Edition will maintain a compatibility with forty years* of Dungeons & Dragons titles, so that it will be possible to use them to play U1 The Sinister Secret of Saltmarsh or Dark Tower or indeed, any of the titles published under the Old School Renaissance movement. 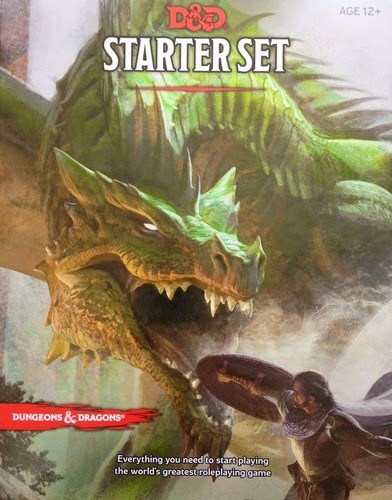 Overall, the Dungeons & Dragons Starter Set is a good introduction to Dungeons & Dragons Fifth Edition, but only if you roleplayed before or are experienced with previous editions. If you have never roleplayed before, then the Dungeons & Dragons Starter Set might not be strong enough an introduction, at least not without the help of a more experienced player or Dungeon Master. It just needed that extra stepping stone and the Dungeons & Dragons Starter Set for the world’s premier roleplaying game would have been the introduction that both Dungeons & Dragons and the hobby needed.